When it comes time to water your yard or garden, you may have been frustrated by your traditional water hose. These hoses get kinks in them, the tangle up, and they’re just generally difficult to move around. An expandable hose can be a better alternative to a standard garden hose. These types of hoses come in different lengths so that you can find the exact size needed for your yard. They are easy to store and require much less storage space than a traditional hose. Plus, most expandable hoses are designed not to tangle or kink up while you’re trying to use them. An expandable hose is ideal for any size yard. They work especially well in small yards because they don’t require much space and can easily be hung up when not in use. Many of the latest expandable hoses are made of durable materials to prevent punctures in the hose. Plus, the materials are flexible so that you can easily wind up the hose when you’re finished using it. The following is a list of the top 10 best expandable hoses in based on reviews. The Instapark heavy-duty recoil garden hose is 50 feet long when stretched to its fullest length. This hose has brass fittings for secure and leak-free connections. The hose comes with a spray nozzle that has 7 different spray settings. The lightweight material makes this hose easy to move around your yard while your work. This hose from Instapark is durable and designed to last. The material is UV-resistant so you don’t have to worry about the hose being weakened from being left outdoors. 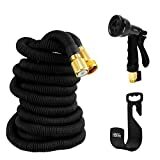 The unique design of this coiled hose means that it wont’ kink or tangle while you’re using it. The expanding garden hose is 100 feet long to allow you to freely move around a large space without worrying about not have enough hose. It has a triple layer core that is designed to resist punctures and tears. 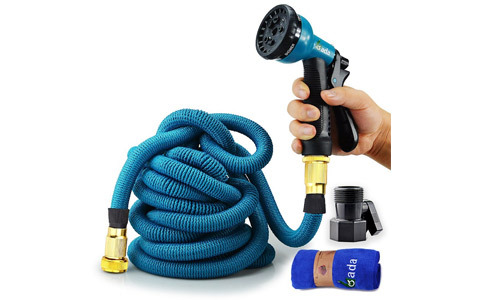 The hose comes with a durable spray nozzle that has 9 different spray settings. 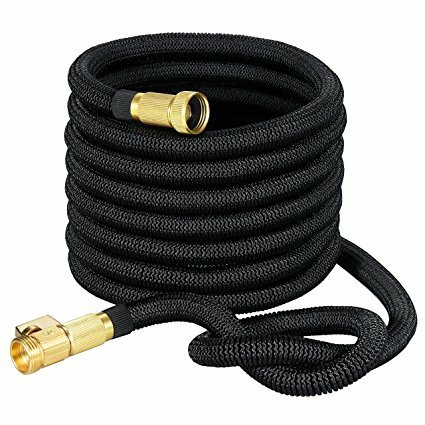 This hose comes with all brass connectors for a secure fit without leaks. It has a convenient on/off valve that allows you to stop the water flow without having to go back to the faucet. The hose comes with 4 rubber washers to help you achieve a leak free connection. 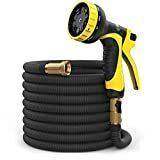 The VicTsing expandable garden hose is 50 feet long when fully extended. It is equipped with an on/off switch that allows you to control the water flow without having to walk back to the faucet. The hose is made with a durable outer fabric that is stretchy and designed to last. The inner core is made of double latex to be resistant to tears and punctures. 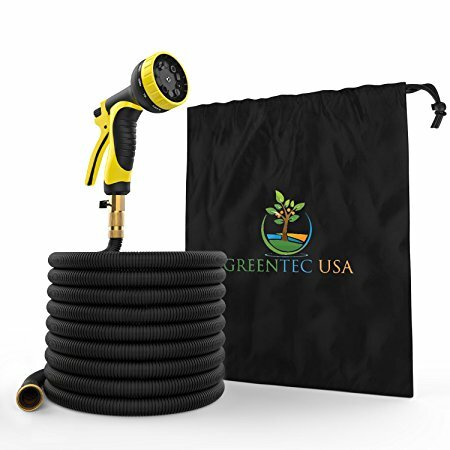 This garden hose from VicTsing can be used for washing your car, watering your garden, cleaning your patio, or other outdoor uses. It has solid brass fittings that are able to connect with the faucet and nozzle securely to prevent leaks and water waste. This 75 foot expandable hose is one of the strongest on the market. It’s made of extremely durable materials and would be ideal for those who need a hose that can withstand heavy-duty usage. It has a triple layer latex core and the outer cover is made of a strong 48-ply fabric to prevent tears and punctures to the inner hose. The hose comes with a stainless steel holder that is designed to cradle the spray nozzle. The included nozzle has several different spray functions. 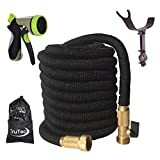 Those hose also has brass fittings that are designed to prevent leaks and provide a secure connection. This 50 foot hose lightweight but strong materials. It has a cool to the touch 16-gauge stainless steel outer shell. This shell is designed to be corrosion and rust-proof. The hose is able to withstand an immense level of pulling force and can work at up to 250 PSI, making it ideal for those who need a hose for professional use or heavy home use. 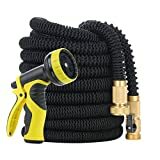 The hose can be connected with other hoses of its kind for whatever length you need. It also works with many different types of nozzles. The hose is safe to use for drinking water as the inside is free of lead, BPA, and other potentially harmful materials. 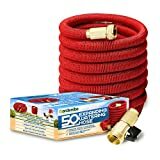 This heavy duty expanding garden hose is a budget-friendly option for anyone looking for a versatile 50 foot garden hose. The outer part of the hose is made of an innovative material that is durable and resistant to tears and punctures. The inner hose is made with a material that has aspects of both plastic and rubber which is designed to be lightweight and long-lasting. The hose is able to withstand a water pressure of up to 150 PSI. It has a water shut off valve that allows you to control water flow without having to walk back to the faucet. The hose has specially structured joint that prevents water leaks even with long-term usage. This expandable garden hose is 100 feet long. The hose recoils easily for storage in the included storage bag. It also comes with a 9-pattern spray nozzle for different gardening needs. When coiled the hose is 33 feet long and it expands to 3 times its size when used. The kink-free design means that you don’t have to deal with tangles and kinks while gardening. The hose is made of heavy duty materials and designed to last. The inner hose has a triple layer latex core and brass fittings for secure connections without leaks. The included nozzle works well for watering plants, cleaning decks, washing cars, and other outdoor uses. The Ohuhu expandable garden hose is 75 feet long when fully expanded. The hose is 24 feet long when not expanded and doesn’t require much space for storage when not in use. It is made of a durable material that is strong and flexible. Plus, it’s resistant kinks and tangles so that you can easily move it around your yard as needed. This hose has quality brass connectors to help prevent leaks at the connection points. It can withstand a significant amount of water pressure and won’t leak or burst due to heavy usage. The hose comes with an 8 function nozzle. The HBlife expandable garden hose is able to expand to 3 times its original length of 33 feet. The 100 foot hose is made of durable materials that are able to withstand extreme hot and cold temperatures. 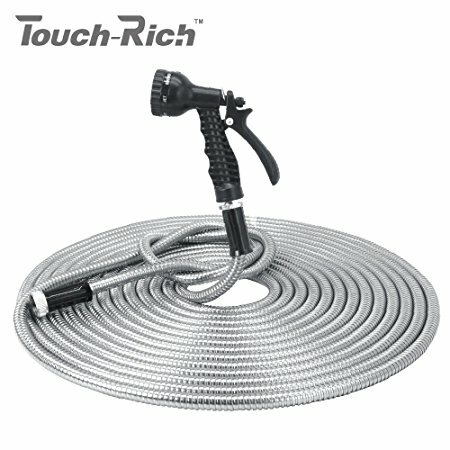 The hose comes with a convenient 8 function nozzle that allows you to complete all your outdoor watering jobs. 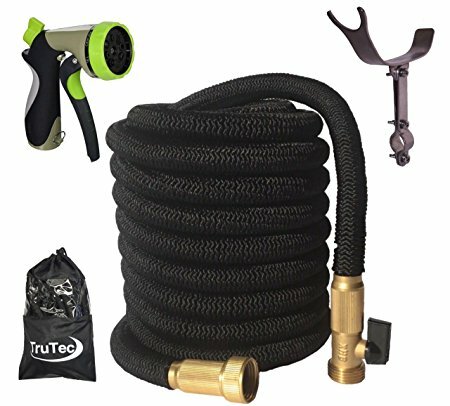 This hose comes with a hose hanger and storage bag for convenience and portability. The all metal connectors on the hose help to create secure connectors so that you don’t have to worry about leakages or wasting water. 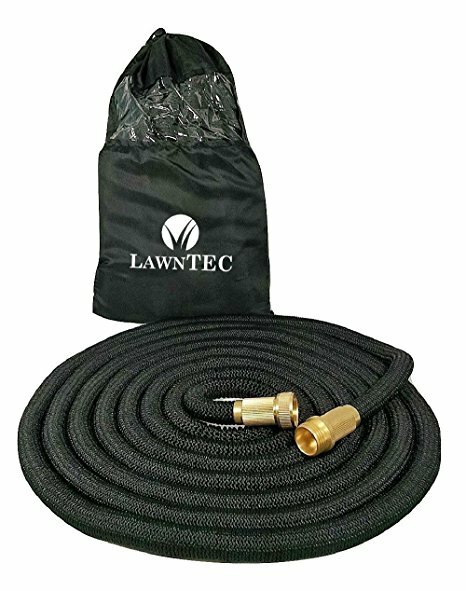 The LawnPRO 50 feet expanding garden hose has a kink-free design to provide an easy way to complete your gardening needs. This hose has copper fittings for secure connections. The outer cover of the hose is made of a lightweight but strong material that is flexible and easy to move around the yard. This hose comes with a 12 month manufacturer’s warranty. 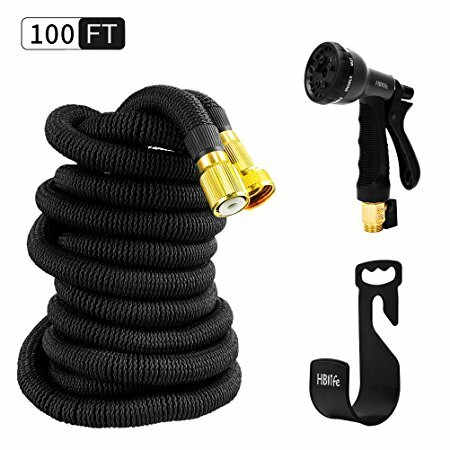 The hose has a unique design that eliminated the ridged rubber and uses a different format of construction for a long-lasting and kink-free design. It comes with a convenient storage bag. Gardening with a traditional style water hose can be time consuming. These hoses are often heavy and they can tangle easily, making your outdoor work take much longer than it should. Traditional hoses are also frustrating when you’re washing cars or doing other outside tasks. If you invest in an expandable hose, you can complete your work quicker and more efficiently. Most expandable hoses are lightweight and don’t tangle or get caught on obstacles when you’re moving them around the yard like traditional hoses often do. 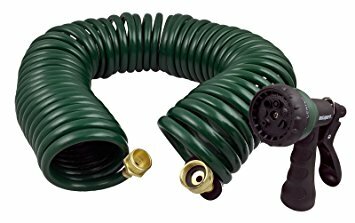 Expandable garden hoses often come with convenient ways to store them like storage bags or hose holders that keep your hose at hand whenever you need it. When shopping for an expandable hose, you can look for one that has all metal fittings for secure and long-lasting connections that don’t allow leaks. 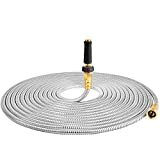 You can also read reviews from other consumers that will help you choose the best expandable hose for the money.